their Constitutional Liberty to choose Romneycare for their State. Governor Romney's "huge problem" is not a Constitutional problem, but a problem of perception and prejudice among conservative generally, and among some pundits and politicians specifically. Because Rick Perry understands the Founding Fathers' original intent for the 10th Amendment, this means Governor Perry is demagoguing the Romneycare issue to his political advantage. Governor Perry tried twice to demagogue the issue of Romnecare in presidential debates, and when the 2nd attempt arose in the ABC-sponsored debate, Mitt Romney was ready! Perry claimed that Romney supports a national health-care plan like the one he helped create in Massachusetts, and contended that Romney changed his book, “No Apology,” to conceal his support for a National Healthcare Plan. In answer to Perry's false allegation, Mitt Romney responded with a put-your-money-where-your-mouth-is bet of $10,000.00 — when you know you’re right, you bet high and call the challenger’s bluff. According to fact-checking website Politifact.com, Mitt Romney would have won the bet. 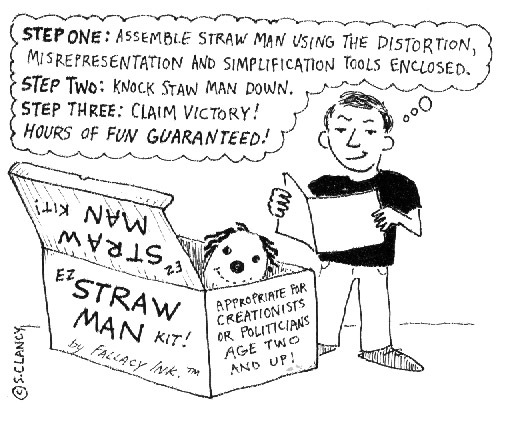 Straw Man Argument = Representing an opponents political position in a weak and inaccurate way, making it appear indefensible as if it were made of "straw" and thus easily toppled. An Argument that an opponent would absolutely clarify and correct, if given the chance. Demagoguing = Framing a political issue in a way that virtually no one would disagree; taking advantage of an issue that enjoys broad popular support, or is tied to a widely-held prejudice. Effective Demagoguing is contingent upon first constructing a "Straw Man Argument" — Demagoguing begins with misrepresenting an opponent's political position. This is how Rick Perry, among others, is praying upon false perceptions and prejudices tied to Romneycare. Straw Man Argument #1 — Romneycare and Obamacare are essentially the same; Romneycare is basically the blueprint for Obamacare. Click for the Facts. Straw Man Argument #2 — Mitt Romney is a big-government liberal masquerading as a conservative, for only a liberal would install a government program equivalent to Obamacare. Click for the Facts. Straw Man Argument #3 — Mitt Romney is a socialist tyrant who has violated the constitutional liberties of Massachusetts citizens by forcing them to purchase a product against their will. Click for the Facts. These are some of the initial misrepresentations that make Demagoguing the issue of Romneycare effective. But these premises are false — they are distortions of the truth. 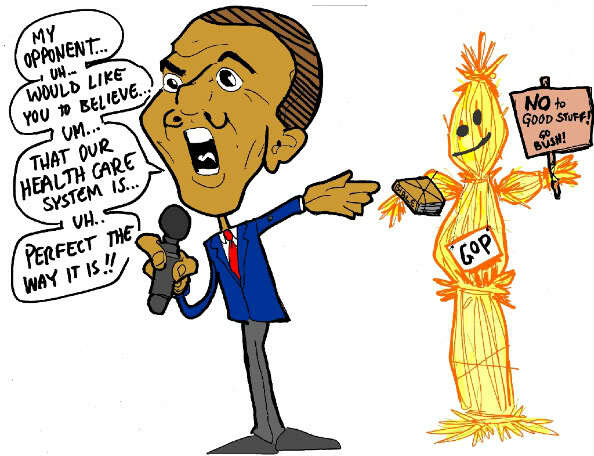 StrawMan Argument #1 — Romneycare and Obamacare are essentially the same; Romneycare is basically the blueprint for Obamacare. The House on the Left is 20,700 sq. ft., and the House on the Right is 700 sq. ft. BURNING QUESTION: What are the chances that the Large House was build from the Small House's Blueprint? Having build homes and drawn blueprints (it's true, I was the BluePrint Doctor in 2002), I know there is ZERO chance that the Large House was build from the Small House's Blueprint — No Chance, ZERO! At best, what these two houses might have in common is the same door knobs or the same towel bars or maybe the same toilets, but most everything else is DIFFERENT just because the contrast in size dictates vast differences. The Large House has a 6,200 square foot guest house, and an indoor swimming pool and pool house that is larger than the Small House alone. Same Blueprint? In your dreams! Moral to the Story: Pay attention to the additional DIFFERENCES contained in 2,000 additional pages of the Affordable Care Act — 2,000 more pages that RomneyCare doesn't have and couldn't fit in 70 pages. Yet pundits pushing ObamaCare continue to claim: ObamaCare is built from the same Blueprint as Romneycare — and if you believe that, I have some beach front property in South Dakota I'd like to sell you, . . . . call me! 1) In a June 2011 GOP Presidential Debate sponsored by CNN, Mitt Romney said this about Massachusetts Healthcare: "if people don't like it in our state, they can change it." In contrast, Barack Obama has consistently resisted the repeal of his healthcare bill, even when the majority of Americans want to repeal ObamaCare. 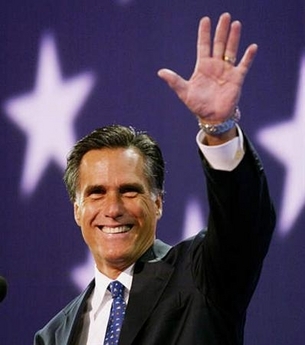 Different from President Obama, Governor Romney respects the will of the people in regard to their healthcare choices. 2) The bill called "ObamaCare" is 2070 pages long, and RomneyCare was only 70 pages in 2006. 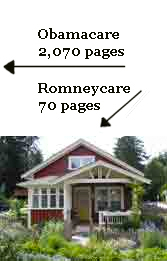 So there are 2,000 more pages of differences between ObamaCare and RomneyCare. 3) RomneyCare was uniquely designed for Massachusetts, but ObamaCare is a one-size-fits-all mandate imposed upon all states, regardless of each state's needs and economic conditions. 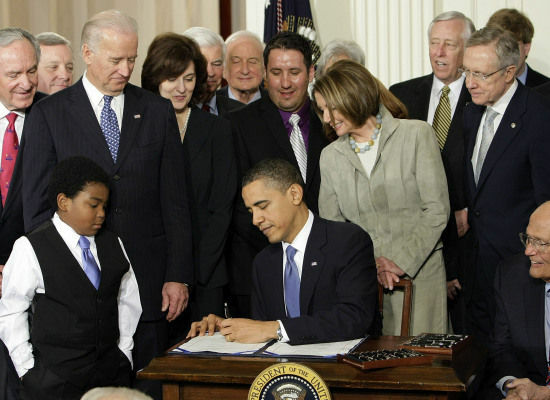 4) ObamaCare expands the size and power of federal government beyond the "few and defined" powers delegated by the Constitution, thus diminishing State powers; in comparison, RomneyCare invokes "numerous and indefinite" powers to mandate that citizens be insured, thus preventing some from "gaming the system" — where free-riders were formerly getting government to pay for medical bills when they could afford to buy insurance in the first place. 5) One Trillion dollars is needed to fund ObamaCare — 500 Billion in higher taxes & 500 Billion borrowed from Medicare. In contrast, taxes were not increased to fund RomneyCare, nor were funds borrowed from Medicare. 6) RomneyCare was enacted only after Mitt Romney balanced the state budget; whereas, ObamaCare was enacted during a time when Barack Obama and a Democrat-dominant Congress didn't even try to balance a budget and didn't even propose a budget, but engaged in massive federal spending, unprecedented in the history of the United States. 7) RomneyCare is constitutional by virtue of the "numerous and indefinite" powers reserved to the States via the 10th Amendment to the Constitution; ObamaCare is unconstitutional because it overreaches the limited federal powers enumerated in Article 1 Section 8of the Constitution. 8) Mitt Romney passed Massachusetts Healthcare with bipartisan input and support; in comparison, Barack Obama imposed ObamaCare upon Fifty States using a partisan approach that largely excluded input from Republican Senators and Congressmen — and continues to exclude input from "We the People." 9) While the majority of Americans don't want Obama-Care, the majority of citizens in Massachusetts support RomneyCare. According to a 2011 survey by Harvard School of Public Health and The Boston Globe, 63% of Massachusetts residents support the 2006 health law, while 21% say they oppose it. The Massachusetts Health Care Plan is in place because the citizens of Massachusetts wanted it in 2006, and still want it in 2011. Mitt Romney applied business solutions to make it happen without raising taxes. While a clear majority like the law, nevertheless, any citizen of Massachusetts who doesn't like RomneyCare has 49 other options to break free of the Massachusetts healthcare mandate. 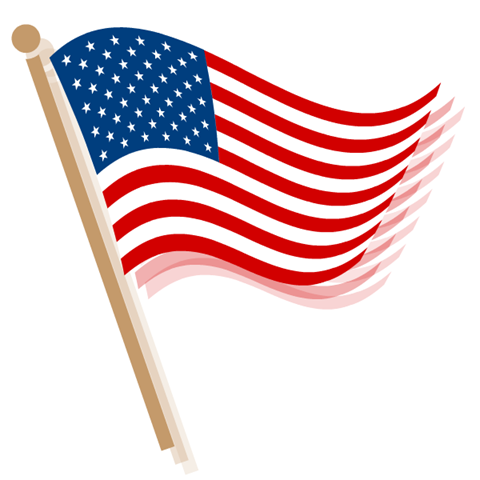 The powers delegated by the Constitution to the federal government are few and defined. Those which are to remain in the State governments are numerous and indefinite. The opposite of Federalism occurs when Americans have an overreaching central government that, in the words of Virginia Attorney General, Ken Cuccinelli, "seeks to plan and control virtually every aspect of our lives and our economy, from health care, to energy, to automobile manufacturing, to banking and insurance." When "We the People" look to central government to take care of every problem, the power and importance State governance is diminished — which is the opposite of Federalism. and try novel social and economic experiments without risk to the rest of the country. In Erie Railroad Co. v. Tompkins (1938), Justice Brandeis wrote the opinion for a 6-2 majority; Brandeis ruled that there is no such thing as a "federal general common law" in cases involving diversity jurisdiction (interstate lawsuits). This Supreme Court decision overturned Swift v. Tyson (1842) — precedent law which had been in place for 96 years. This landmark ruling meant that federal courts must apply the law of the State where the legal injury occurred. This High Court decision strengthened the sovereignty of States, and reversed a trend toward centralizing government power. 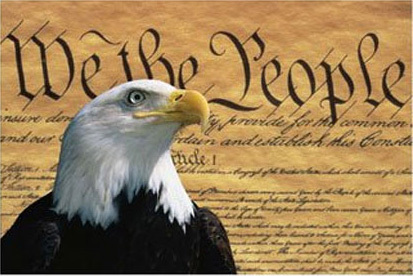 As established by the Founding Fathers through the United States Constitution, federal government was intended to be limited with "few and defined" powers. But in direct defiance of Original Intent, ever since the New Deal, federal government has gradually grown larger and larger, gaining more and more power — that's not Federalism, that's not what the Founding Fathers put in place. StrawMan Argument #2 — Mitt Romney is a big-government liberal masquerading as a conservative, for only a liberal would install a government program equivalent to Obamacare. 1 - Romneycare is supported by the people of Massachusetts 3 to 1, and the U.S. Constitution protects The People's right to choose what they deem best for their State. In contrast, the majority of Americans do not want Obamacare, and even if they wanted it Article 1, Section 8 of the U.S. Constitution does not authorize the Federal Government to mandate such a law — Why Obamacare is Unconstitutional. 2 - Mitt Romney supports the will of the people of Massachusetts, "if people don't like it in our state, they can change it." In sharp contrast, Barack Obama is a rigid ideologue who wants to impose his ideology more than respect the preferences of the people. ** * Obamacare calls for patient medical records to be enter into a national database, making confidential information available to federal bureaucrats in Washington D. C., so those bureaucrats can make decisions that interupt free-market flow and individual free-will choice. **** Obamacare creates panels of bureaucrats that will make rationing decisions: Who get what healthcare and when — which is precisely why so many Canadians travel to the United States for urgent healthcare needs, instead of remaining on long waiting lists to get life-saving surgeries and treatments. Again, Romneycare basically requires Massachusetts citizens to buy health insurance, and beyond that, Health Care in Massachusetts functions according to the Free Market. Obamacare is a federal law created expressly out of big-government-liberal ideology: Progressive Liberals see government as the solution to most societal problems; thus, government needs to be big to provide "nanny" oversight for every potential problem and injustice. In contrast, Romenycare is a businessman's solution to creating a better financial bottom line for the citizens of Massachusetts. Further, Mitt Romney is aware of States' Rights established by the 10th Amendment, and has worked within that Constitutional Framework to invoke "numerous and indefinite" State powers in mandating that citizens of Massachusetts be insured. Mitt Romney's healthcare solution was pragmatic and not ideological. The pragmatic mandate approved by The People prevents individuals who were formerly "gaming the system" from becoming "free-riders" and getting government to pay emergency medical bills — when those same "free-riders"could afford to pay their own way in the first place. The bottom line was a "business" no-brainer: More Massachusetts citizens are insured against medical misfortune, and at a lower cost compared to the previous system of "gaming" and "free-riding." StrawMan Argument #3 — Mitt Romney is a socialist tyrant who has violated the constitutional freedoms of Massachusetts citizens by forcing them to purchase a product against their will. Although the Massachusetts Healthcare Law is nicknamed "RomneyCare," to be fair to Mitt Romney, the law was not shaped entirely according to his recommendations. For example, Governor Romney vetoed eight portions of RomneyCare to include an Employer Mandate, which were all eventually overridden by the a Democrat-dominant State Legislature. The Massachusetts Health Care Plan is in place because the citizens of Massachusetts wanted it in 2006, and still want it in 2011. the majority of citizens in Massachusetts support RomneyCare. According to a 2011 survey by Harvard School of Public Health and The Boston Globe, 63% of Massachusetts residents support the 2006 health law, while 21% say they oppose it. To characterize Mitt Romney as a big-government liberal imposing his will upon the people of Massachusetts is a blatantly false characterization. It is the uniqueness of the political will of the majority of the Massachusetts citizens, coupled with a Democrat-dominant legislative majority, that made RomneyCare possible. In contrast, the same plan could not pass in Texas because the majority of the citizens there, coupled with a conservative-dominant legislature would likely NOT be in favor of it. However, if the bottom-line cost were equal to or LESS than the current system, wouldn't conservative-minded citizens and politicians in Texas consider supportting a pragmatic business solution? Love it or Leave it, The People of each State have Constitutional Liberty to choose what they deem best for their State. Again, while a 3 to 1 majority of Massachusetts citizens prefer their current Healthcare System, in contrast, the majority of Americans don't want Obamacare. 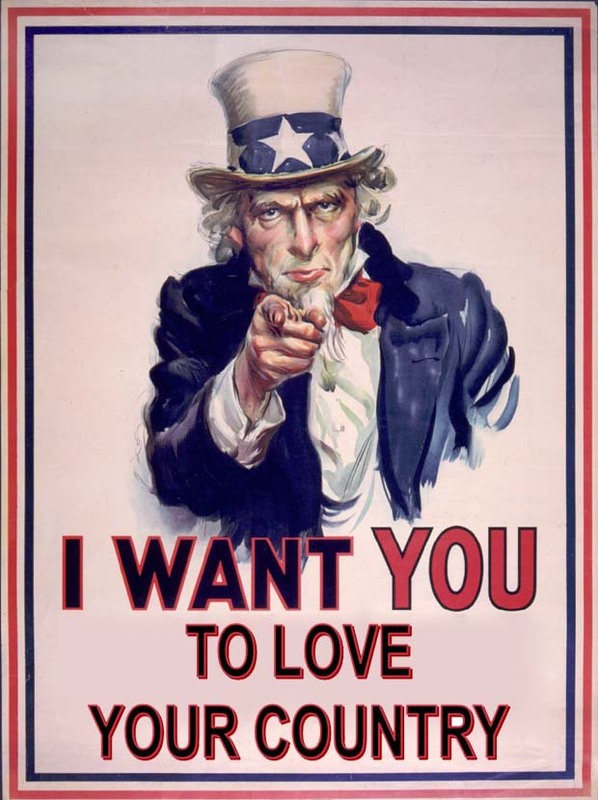 And even if they did want it, American citizens couldn't have it because an individual federal mandate requiring U.S. citizens to purchase a product is Unconstitutional — it cannot be justified at the federal level by the Commerce Clause, the Necessary & Proper Clause, or the General Welfare Clause, as established in Article 1, Section 8 of the U.S. Constitution. 2) The mandate requiring all people who drive cars to purchase liability insurance to cover the costs of auto accidents. In the name of "liberty," some Libertarians ironically argue that the majority of Massachusetts citizens should NOT have the "liberty" to prefer a systems that insures more, while costing less. 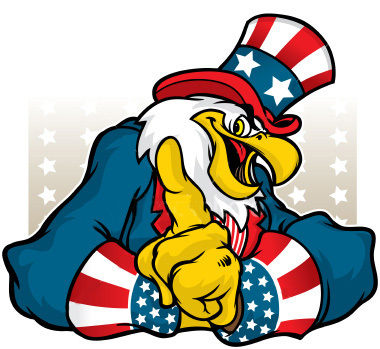 Burning Question: Why should a minority of Libertarians (especially Libertarians located in other States besides Massachusetts) think that they have the prerogative to tell the majority of citizens within any State, what they should prefer? without risk to the rest of the country." It is important to note that Brandeis said " if its citizens choose" — that's the Liberty and prerogative of the people residing within each of 50 States to prefer the political system of their choosing. This means Mitt Romney is NOT stripping liberty from anyone: Remember, Mitt Romney is NOT the governor of Massachusetts anymore — though many continue to assign blame to the former Governor in the HERE and NOW. Massachusetts citizens are at Liberty to do as Governor Romney suggested during a GOP presidential debate: "if the people don't like it in our state, they can change it" — that's Mitt Romney respecting the liberty of the People who empowered him, in the first place, to pass the Massachusetts Healthcare plan, with the willing cooperation of a Democrat-dominant legislature. Mitt Romney's statement that "the people . . . can change it" supports the conclusion that Mitt's role in bringing about a pragmatic solution with a more favorable financial bottom line, was NOT ideological. Further, Governor Romney vetoed eight portions of RomneyCare, to include an Employer Mandate, which were all overridden by the Democrat-dominant State Legislature — this further supports the fact that the final Healthcare product was not shaped according to Mitt Romney's political preferences — even though Romney gets all the credit and the blame. 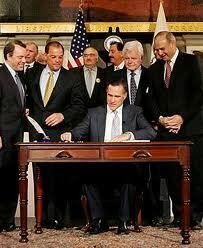 Mitt did not force RomneyCare upon the Democrat-dominant legislature or the Democrat-dominant electorate. The citizens of Massachusetts got what they wanted. Why should Libertarians and Conservatives residing outside of Massachusetts have any say as to the political preferences Massachusetts citizens? Ironically, telling the citizens of Massachutsetts what to do, is incompatible with the very premise of Libertarianism — Live and let live. RomneyCare exists today, because that's what a Democrat-dominant Legistlature and Electorate wanted. During her recent appearance on Face The Nation, Michele Bachmann said: "I am firmly against the individual mandate. I think it is unconstitutional, whether it's put into place at the state level by a state legislature or whether it's put into place at the federal level. I think it's unconstitutional." But where does the U.S. Constitution stipulate that an individual healthcare Mandate is "prohibited" — especially when that Mandate is supported by the majority of citizens within a State? Can Michele Bachmann really make a Constitutional case to back-up what she thinks? Answer: Only if she makes the 10th Amendment disappear, and ignores the Founding Fathers' Original Intent as to Federalism and States' Rights. "The Constitution establishes" or "James Madison said" or "Supreme Court Justice Brandeis ruled" or "Ronald Reagan affirmed" — weigh the authority of such words compared to "Michele Bachmann thinks." Even if Bachmann were elected President of the United States, it is not the prerogative of the Federal Government to dictate what citizens of certain States should want and prefer for their State — a President (and Congress) must work within the enumerated federal powers declared in the Constitution. nor prohibited by it to the States, are reserved to the States respectively, or to the people. to the federal government are few and defined. Notice how President Reagan explicitly spoke of "that federal establishment," as opposed to State governments. Why? Because Reagan understood the Principle of Federalism. In part, Federalism means that the United States is comprised of 50 separate State "experiments" and when citizens don't like the governance of the State they are in, they can "vote with their feet" and move to another State. Which is precisely what has been happening with California for many years. George Will wrote an article that chronicles the exodus of businesses and individuals out of California, entitled "California as Liberalism's Laboratory" — of course the word "laboratory" is in reference to the words of Justice Brandeis. Many Business owners and individual citizens have not preferred the "novel social and economic experiment" in California, and have voted with their feet by moving to another State. Whether the California "experiment" is working or not, nevertheless, it's the Constitutional Right of the people of California to have what they want, and are presently getting. That whenever any form of government is destructive of these ends [Life, Liberty, and the pursuit of Happiness], it is the Right of the People to alter or to abolish it, and to institute new Government. 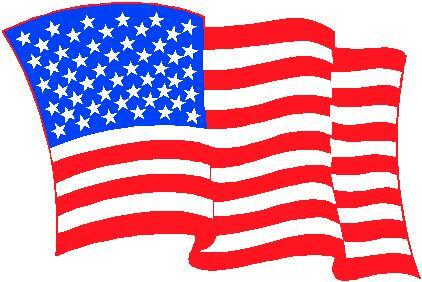 "We the People" empower governments and change governments. The citizens of California possess the ultimate prerogative over State powers, just as the citizens of Massachusetts have the authority and liberty of expressing their prerogatives. Some pundits write about Governor Romney's "magic act" — where Romney campaigns against an ObamaCare bill that is supposedly identical to the law in Massachusetts. PolitiFact.com reports that the two bills have strong similarities, but the biggest difference is being ignored! — the Constitutional Difference. Mitt said in March 2010 interview, “People often compare Obama's plan to the Massachusetts plan. 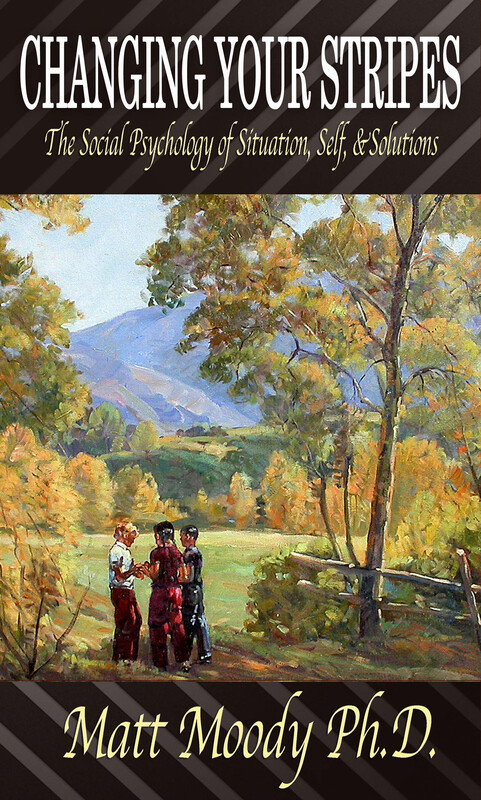 They’re as different as night and day.” Romney's right! Especially when one deems a Constitutional Bill as "day" and an Unconstitutional Bill as "night." At the level of legislation, RomneyCare and ObamaCare could be identical to the "t," and still ObamaCare would be Unconstitutional because Article 1, Section 8 does not empower federal government to install a HealthCare Mandate for all 50 States; in contrast, the 10th Amendment does empower State governments to do virtually anything that a majority of State citizens want, and will vote for. One reason why many Americans perceive RomneyCare to be a problem for Mitt Romney in the 2012 Presidential Election is because they may not understand the meaning of the 10th Amendment to the Constitution, State Police Powers, and Federalism. Sweeping aside second-hand spin from ideologues, name-callers, and haters, the question of Constitutionality for RomneyCare vs. ObamaCare is best answered by . . . surprise . . . the very words of the Constitution, augmented by other wise words from the Founding Fathers. To lay a foundation of understanding for this issue, let's first define the meaning of the word "mandate." So, what is a mandate (noun), and what does it mean to mandate (verb)? Mandate (n.) from Latin mandatum "commission, order," and within the context of elections, mandate is "implicit approval of a policy as conferred by voters to winners of an election." Mandate (v.) from Latin mandare "to order, commit to one's charge," from manus "hand"
(as in manual) + dare "to give" — literally "to give into one's hand." The word "mandate," shares the same etymological root as the words "command" and "mandatory." So a mandate is a required rule, regulation, or law that people must follow or face consequences — for if there were no consequences attached, a mandate would have no "teeth" to cause people to follow a mandatory rule, regulation, or law. All laws that carry consequences for failure to obey ARE "mandates." The United States is a nation of laws. American citizens are required to obey laws, and if they choose not to obey those laws, then Governments mandate (require) consequences — legal constraints that make those laws mandatory. Mandates are mandatory commands via laws legislated by authority, and enforced by consequences. Every State is swimming in mandates: States mandate that children and teenagers must attend school. States mandate that those who drive cars must purchase liability insurance. States mandate that people can't rob banks, steal cars, or commit murder without facing mandatory consequences. WHY do States establish mandates? Some Libertarians view most mandates as infringements upon Liberty. In most cases, a mandate will protect a higher Liberty in exchange for giving up a lower Liberty. For Example: Governments mandate speed limits along the roads we travel, and such speed limits increase our Liberty to travel safely. Governments mandate that you and I cannot steal from a neighbor, and such mandates increase our Liberty to own property and enjoy our property, and NOT have it stolen. 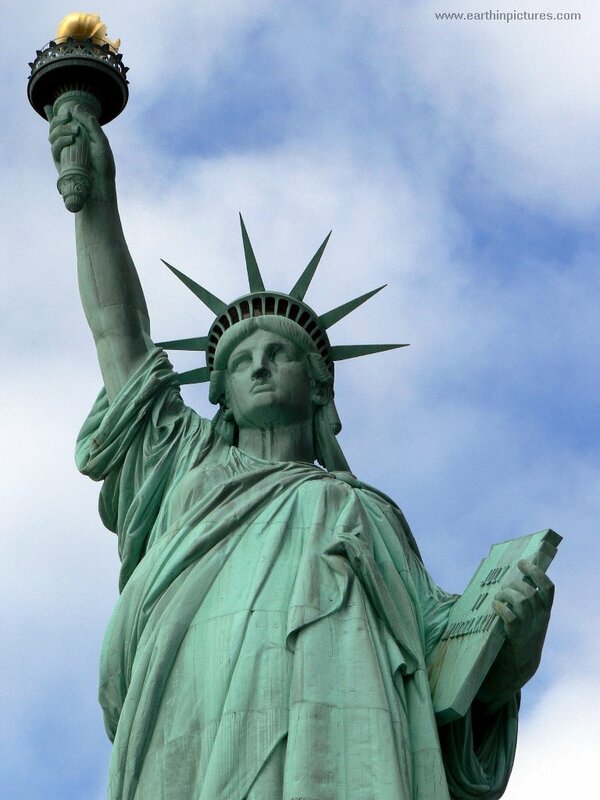 Mandates are NOT passed to oppress the People, but to protect Higher Liberties. Further, every Mandate is established by the approval of the People, else that Mandate will be changed via Voting and Elections. But why is it Constitutional for States to enact such broad mandates? To answer this question, we must examine the words of the Constitution and of our Founding Fathers. The Constitution delegates to the federal government "few and defined" powers — also called enumerated powers — as set forth in Article 1 Section 8 of the Constitution. The federal government can legislate mandates, but can only do so constitutionally within the constraints of the "few and defined" powers that have been "delegated" by the Constitution. In contrast to the federal governments limited powers, the Constitution of the United States has explicitly delegated "numerous and indefinite" powers to the States through the 10th Amendment. With State governments having numerous and indefinite powers beyond the federal government's enumerated powers, who then, will check State governments from abusing such broad powers? ANSWER: We the People possess the power to check governments from abusing and usurping power. For the People to "secure" inalienable rights of life, liberty & happiness, the Declaration of Independence affirms that "governments are instituted among men, deriving their just power from the consent of the governed." "That whenever any form of government is destructive of these ends [Life, Liberty, and the pursuit of Happiness], it is the Right of the People to alter or to abolish it, and to institute new Government." Why is RomneyCare Constitutional? By virtue of powers delegated by the Constitution, the 50 States have numerous and indefinite powers to legislate mandates to secure inalienable rights. And any time citizens of Massachusetts don't want RomneyCare, they can institute new Government to change it. Articles claiming that RomneyCare is an "albatross around Mitt Romney's neck," focus on similarities between ObamaCare and RomneyCare at the level of legislation, and skip the Constitutional question. The faulty logic goes like this: If ObamaCare is bad, then RomneyCare is bad too — because they are essentially the same (in terms of the individual mandate and other legislative details). As to sameness, please reread the Nine Differences listed previously, and then realize the bottom line: RomneyCare is Constitutional because States have "numerous and indefinite" powers; whereas, ObamaCare is unconstitutional because it overreaches the limited federal powers enumerated in Article 1 Section 8 of the Constitution. ObamaCare is Unconstitutional because the 2,700 page bill is not just about Affordable Health Care for all Americans; instead, ObamaCare is an enormous usurpation of power that pushes far beyond the limited, enumerated powers delegated to the federal government by the Constitution. To justify ObamaCare, the federal government must find authority to do so in Article 1 Section 8 of the Constitution — wherein the federal government is delegated enumerated powers that are, as James Madison described, "few and defined" in contrast to State powers that are "numerous and indefinite." In both the Virginia and Florida Lawsuits against Obama-Care, the federal government has tried to find justification for the Obama-Care Mandate in three clauses from Article 1 Section 8 — the Commerce Clause, the Necessary and Proper Clause, and the General Welfare Clause. Here's why each of these clauses fail to justify the ObamaCare Mandate. Here is why invoking the Commerce Clause fails: It is clear that "doing nothing" is NOT an act of commerce. Thus "doing nothing" cannot be regulated by the Federal Government via the Commerce Clause. In contrast, if the act of "doing nothing" on the part of some citizens, impacts Life, Liberty, and Happiness with a State, that State can legislate Mandates for the benefit of all State residents. But the federal issue is not that easy: One Supreme Court case, Gonzales v. Raich, raised a question of "undercutting" in regard to regulating Interstate Commerce. Hence the question arises: Will an American citizen's choice to NOT purchase a good or service (health insurance) have an effect upon Interstate Commerce that "undercuts" a broader regulatory scheme of Interstate Commerce? But this question jumps the gun! The "act of non-commerce" that is alleged to undercut a broader regulatory scheme, is a commerce question originated/created by the ObamaCare Mandate, in the first place. This means, that the Federal Government is both attempting to originate/create a situation of commerce by law (mandating everyone to buy insurance), and then turning around and declaring: "we must now regulate the commerce we have originated/created." In other words, the constitutional regulation of "Commerce . . . among the several States" is Commerce that the States originate/create; thereafter, the Federal Government has constitutional power to regulate that State-Initiated Commerce. So even if "doing nothing" does have an effect upon the regulation of Interstate Commerce, this legal logic leap frogs over the prior question, a question that the Supreme Court has never ruled on: Does the Federal Government have the constitutional power in the first place, to require individual citizens to purchase a product or service — can the Fed force citizens to buy health insurance? According to the Federal Judges who have ruled in the Virginia and Florida Lawsuits against Obama-Care, the answer is "no!" — the Commerce Clause does not justify the regulation of non-commerce among the States — acts of non-commerce originated/created by the ObamaCare Mandate in the first place. in the Government of the United States, or in any Department or Officer thereof. Notice that Congress is empowered to make "necessary and proper" Laws specifically to carry "into Execution the foregoing Powers" — referring to the limited, enumerated powers delegated to the federal government. In other words, mandating that a person must buy health insurance needs to be justified, in the first place, by the few and defined powers listed in Article 1 Section 8 of the Constitution. So the Necessary and Proper Clause can only be invoked as one of the enumerated powers is also invoked. That is why Judge Henry Hudson ruled as he did in the Virginia Lawsuit against Obama-Care. The Federal Government has tried to justify the ObamaCare mandate via the "General Welfare Clause," a clause that is embedded within Congressional Taxation Power. But to invoke the General Welfare Clause, the Government must first establish that the "penalty" for not buying Health Insurance — the very "penalty" spoken of in the 2070-page behemoth called ObamaCare — is really a tax, and not a penalty. In the effort to pass ObamaCare through Congress, President Obama and the authors of Obama-Care played politics with words; trying to distance themselves from the perception of higher "taxes," the President, the Obama-Care authors, and Democrat Senators and Congressmen all called the monetary assessment for failure to purchase health insurance a penalty — and not a tax! This is precisely why Judge Henry Hudson pointed to the historical record of "pre-enactment representations," where both the "Executive and Legislative branches" consistently called the "penalty" for failure to purchase healthcare insurance, a "penalty" and not a "tax." Thus, Federal Judge ruled that the General Welfare Clause has no force. Saying that something is so, when it isn't so . . . doesn't change factual reality. Judge Antonin Scalia summed up the problem with the Majority Ruling this way: " There is no way to regard this penalty as a tax. ... You don’t interpret a penalty to be a pig. It can’t be a pig.”Scalia reasoned that the meaning of the word "penalty" cannot bear the definition of the word "tax." Penalty = a punishment imposed for breaking the law. and business profits or added to the cost of some goods, services, and transactions. In the case of Obamacare, what is being taxed is . . . choosing to do nothing — hence a tax is added to the act of "doing nothing" — and now you see why Scalia quipped: " You don’t interpret a penalty to be a pig. It can’t be a pig." NEVERTHELESS, even if the penalty were deemed a tax, there is still a huge Constitutional problem this virtually impossible to overcome: All federal taxes, save income taxes, must be assessed proportionally according to State populations — this is called a "Capitation" Tax. Even if the penalty for failure to purchase health insurance were a tax, and not a penalty, here's another constitutional problem. All taxes laid by the Federal Government, save income taxes, must be proportional to the populations of each State. Because the Obama-Care tax/penalty is NOT an income tax or a "capitation" tax, proportional to State populations, this means the Obama-Care tax/penalty is NOT Constitutional — and thus NOT legal. "Even if the taxing power enables Congress to impose a tax on not obtaining health insurance, any tax must still comply with other requirements in the Constitution. Plaintiffs argue that the shared responsibility payment does not do so, citing Article I, §9, clause 4. That clause provides: “No Capitation, or other direct, Tax shall be laid, unless in Proportion to the Census or Enumeration herein before directed to be taken.” This requirement means that any “direct Tax” must be apportioned so that each State pays in proportion to its population. According to the plaintiffs, if the individual mandate imposes a tax, it is a direct tax, and it is unconstitutional because Congress made no effort to apportion it among the States." The Roberts Court ultimately ruled that the Constitutional Requirement not be followed, based upon a precedent SCOTUS case where the high court unanimously decided that "apportioning a tax would make little sense, because it would have required taxing carriage owners at dramatically different rates depending on how many carriages were in their home State." Within a Constitutional context, the term "Police Powers" has a broader definition that goes beyond "law enforcement." The root of the word "police" is "polis" which means "city" or "state." The root "polis" is found in the word "metropolis." — metra = mother + polis = city, hence Metropolis is the Mother City. Police Powers refer to powers held primarily by Cities and States; thus, Police Powers literally means polis powers, in other words, City or State Powers. The United States Constitution directly empowers the States to regulate the general welfare, morals, health, and safety of the citizenry. The exercise of police power takes the form of making laws, compelling obedience to those laws through legal consequences and even through physical coercion — this is the common connotation of "police" as "law enforcement." Again, Police Powers are broader than the common understand associated with the word "police." Because the federal government has limited powers granted by the Constitution, it does not have a general police power directly over the U.S. citizenry, as the states do. Clearly, certain enumerated powers stipulated in Article 1, Section 8 empower federal government to act on matters of foreign relations and border security. All other powers to regulate the general welfare, morals, health, and safety of the citizenry are held by the States, as specifically granted in the Tenth 10th Amendment. Given that the States created the Federal Government, and then gave it power to regulate Interstate Commerce, we understand that decisions to originate Commerce in the first place, resides with the States. Dr Matt's Intriguing Insight: ObamaCare is both attempting to originate/create a situation of commerce by law (forcing everyone to buy insurance), and then turning around and declaring: "we must now regulate the commerce we have originated/created, as provided by the commerce clause." If the power to require citizens to purchase goods or services is NOT enumerated among the 18 clauses of Article 1, Section 8, of the Constitution, then the Federal Government does NOT have that power. The Congress shall have Power — To make all Laws which shall be necessary and proper for carrying into Execution the foregoing Powers, and all other Powers vested by this Constitution in the Government of the United States, or in any Department or Officer thereof. During discussions of the proposed constitution, this clause provoked controversy: Anti-Federalists expressed concern that the clause would grant the federal government boundless power; in contrast, Federalists argued that the clause would only permit execution of power already granted by the Constitution — Alexander Hamilton defended this second interpretation in the Federalist Papers. Arguing in Federalist No. 44, James Madison concurred with Hamilton, stating that without this clause the constitution would be a "dead letter." At the Virginia Ratifying Convention, Patrick Henry took the opposing view, saying that the clause would lead to limitless federal power that would inevitably menace civil liberties (e.g., liberty from federal powers that force citizens to purchase particular goods or services). Through clarifications by Thomas Jefferson and Chief Justice John Marshall, the mention of "general welfare" within the Taxing and Spending Clause was never intended to give unlimited power to the federal government. Here's how Thomas Jefferson explained the general welfare clause: “the laying of taxes is the power, and the general welfare the purpose for which the power is to be exercised. They [Congress] are not to lay taxes ad libitum [according to pleasure] for any purpose they please; but only to pay the debts or provide for the welfare of the Union. Jefferson's statement suggests that the "general welfare" of the people would be an aim reserved to the States via the 10th Amendment. And because the 10th Amendment reserves all rights and powers to the States, that are not enumerated to the Federal Government, thus, it is the States that would address concerns of matters of welfare of the people — whether general or specific. According to Jefferson, the welfare of the Union, as opposed to the more specific welfare of the people [living within the Union], is the purpose for federal taxation and spending. The "Union" being the collective coalition of 50 states. In a 1824 ruling of Gibbons v. Ogden, Chief Justice John Marshall described in an "obiter dictum" [said in passing] the following limit to the General Welfare Clause: "Congress is authorized to lay and collect taxes, &c. to pay the debts and provide for the common defence and general welfare of the United States. . . . Congress is not empowered to tax for those purposes which are within the exclusive province of the States." In other words, "general welfare" must be defined within the enumerated powers of the federal government. James Madison maintained that spending must be tied to one of the specifically enumerated federal powers — such as regulating interstate or foreign commerce, or providing for the military. Madison argued that the General Welfare Clause is not a direct grant of power, but a statement of purpose that qualifies the taxation power. • Alexander Hamilton offered his interpretation of "general welfare" after the Constitution had been ratified. He argued that federal spending, as an enumerated power, could be done independently to benefit the general welfare — such as to assist national agricultural or educational needs. However such federal spending should be general in nature and would not favor a specific section of the country. Based upon how Justices Breyer, Ginsburg, Souter, and Stevens ruled in United States v. Lopez, United States v. Morrison, and Gonzales v. Raich, they interpret the Interstate Commerce Clause to have few limits, if any. These four Justices have ruled in favor of Federal Government regulation 3 out of 3 times — even when the issues were NOT directly about commerce, nor about interstate dealings. Justices Roberts, Alito, and Sotomayor have not made rulings on the Commerce Clause yet. If reputations for being conservative or liberal mean anything, then Roberts and Alito may support Commerce Clause Limits, and Sotomayor would broadly interpret the Commerce Clause as granting powers for the Fed to regulate. The term "broadly interpret" usually means ignoring the original intent of the Founding Fathers. As for Justices Thomas, Scalia, and Kennedy, . . . Thomas has come down on the side of Limits to the Commerce Clause three 3 out of 3 times, with Scalia and Kennedy ruling 2 twice for Commerce Clause limitations and once for federal government regulation. In order to drive up wheat prices during the Great Depression, the U.S. government imposed federal limits on wheat production based on acreage owned by a farmer. Filburn was growing more than the federal limits, and was ordered to destroy his crops and pay a fine -- even though he was producing the excess wheat for his own use and had no intention of selling it. Ruling: In a unanimous decision, the court upheld the "Agricultural Adjustment Act." The intended rationale of this federal law was to stabilize the price of wheat on the national market. The court ruled that the federal government has the power to regulate interstate commerce through the Interstate Commerce Clause of the Constitution. Alfonso Lopez, Jr. was a 12th grade student at Edison High School in San Antonio, Texas. In 1992 he carried a concealed weapon into the school. Confronted by school authorities, Lopez admitted to having the weapon and was charged with violation of the federal Gun-Free School Zones Act of 1990. Ruling: In a 5-4 decision, the Supreme Court affirmed the decision of the Court of Appeals: While Congress has broad lawmaking authority under the Commerce Clause, the power is limited, and does not extend so far from "commerce" as to authorize the regulation of the carrying of handguns — especially when there is no evidence that carrying them affects the economy substantially. In a concurring opinion, Justice Clarence Thomas argued that allowing Congress to regulate intrastate, noncommercial activity under the Commerce Clause would confer on Congress a general “police power” over the entire nation. In 1994, the United States Congress passed the Violence Against Women Act. That fall a Virginia Tech freshman, Christy Brzonkala, was allegedly assaulted by Antonio Morrison and James Crawford, members of the school's football team. A state grand jury did not find sufficient evidence to charge either man with a crime. Brzonkala then filed suit under the Violence Against Women Act. Ruling: In a 5-4 decision, the Supreme Court affirmed that Congress lacked authority, under either the Commerce Clause or the Fourteenth Amendment, to pass the "Violence Against Women Act." Writing for the majority, Chief Justice Rehnquist held that "the noneconomic, criminal nature of the conduct at issue was central to our decision." In 1996, California voters passed Proposition 215, legalizing the medical use of marijuana. California was one of eight states that allowed medicinal use of marijuana. Defendant Angel Raich used homegrown marijuana to relieve pain; her use was legal under California law, but illegal under federal law -- the 1937 Marijuana Tax Act. Ruling: The decision was 6-3 in favor of the Federal Government's ability to regulate: Banning the growing of marijuana for medical use, to prevent or limit access to marijuana for other uses. Majority: Stevens, joined by Kennedy, Souter, Ginsburg, Breyer. Again, Scalia voted in favor of Commerce Clause limitations in Lopez and in Morrison. "Relying on Congress’ abstract assertions, the Court has endorsed making it a federal crime to grow small amounts of marijuana in one’s own home for one’s own medicinal use. This overreaching stifles an express choice by some States, concerned for the lives and liberties of their people, to regulate medical marijuana differently." "If I were a California citizen, I would not have voted for the medical marijuana ballot initiative; if I were a California legislator I would not have supported the Compassionate Use Act. But whatever the wisdom of California’s experiment with medical marijuana, the federalism principles that have driven our Commerce Clause cases require that room for experiment be protected in this case." "Federalism promotes innovation by allowing for the possibility that a single courageous State may, if its citizens choose, serve as a laboratory; and try novel social and economic experiments without risk to the rest of the country..."
"Respondent's local cultivation and consumption of marijuana is not 'Commerce ... among the several States.' . . . Certainly no evidence from the founding suggests that 'commerce' included the mere possession of a good or some personal activity that did not involve trade or exchange for value." "If the Federal Government can regulate growing a half-dozen cannabis plants for personal consumption (not because it is interstate commerce, but because it is inextricably bound up with interstate commerce), then Congress' Article I powers -- as expanded by the Necessary and Proper Clause -- have no meaningful limits." "Whether Congress aims at the possession of drugs, guns, or any number of other items, it may continue to appropriate state police powers under the guise of regulating commerce." "If the majority is to be taken seriously, the Federal Government may now regulate quilting bees, clothes drives, and potluck suppers throughout the 50 States. This makes a mockery of Madison's assurance to the people of New York that the 'powers delegated' to the Federal Government are 'few and defined,' while those of the States are 'numerous and indefinite.'" If the Supreme Court had allowed individuals to grow marijuana at home for "personal medicinal purposes," this would have opened Pandora's Box: thus Interstate sales and use of marijuana would have become a nuisance for other States where marijuana growing and using is illegal — state anti-marijuana laws would have been "undercut." One of the key differences between the State of Virginia's Lawsuit compared to Gonzales v. Raich, is that Marijuana use is illegal in most States and exercising one's liberty NOT to purchase Health Insurance is NOT illegal in all States — that is, until ObamaCare introduced its coercive Mandate. This means the threat of "undercutting" a broader network of State Laws is NOT a factor in the Virginia Law Suit. Expressing one's liberty to NOT purchase a good or service has never been illegal; in contrast, growing and using marijuana is illegal — that's a key difference in the two court case, thus the undercutting principle should not apply in the Virginia Lawsuit. This means the freedom for individual citizens to NOT engage in commerce (to choose NOT to buy Health Insurance or any other good or service) is NOT regulate-able by the Federal Government via the Interstate Commerce Clause, because that choice is NOT an act of commerce and further does not involve Interstate coordination or Interstate "undercutting" — which was the tipping point for Gonzales v. Raich, according to Scalia. Clearly a citizens choice to "do nothing" need not be coordinated and regulated between the several States by the Federal Government; therefore, the Health Care Freedom Act passed by the State of Virginia should be ruled Constitutional by the Supreme Court; and the universal mandate forcing citizens to buy health insurance, and levying a monetary penalty if they don't, should be found Unconstitutional. The power for Governments to regulate an individual's decision to "do nothing" (to NOT buy a good or a service) is unquestionably reserved to the States by the Tenth Amendment of the United States Constitution — that is IF, as the Declaration of Independence says "by the consent of the governed," a majority of citizens want such a regulation. The people of the State of Virginia have decided they want liberty from being compelled to buy health insurance! In contrast, if the majority of Massachusetts citizens want to be insured, they have the liberty to elect representative government to establish it — and thus enjoy the freedom to be insured. That's Federalism. The best Health Care Reform at the federal level will be Compassionate, Constitutional, and will NOT kill the Economy by driving up the National Debt. But operating from limited powers, the best federal government can do is to remove interstate restrictions and open up free market competitive among the States. Ultimately Healthcare Reform must happen at the State level, because States have numerous and indefinite powers that federal government does not have. Because ObamaCare expands the size and power of federal government, making it more of a Central Government that overreaches and diminishes the numerous and indefinite powers of the States, the Supreme Court should rule 5-4 that ObamaCare is unconstitutional. I write separately to say a word about the Commerce Clause. The joint dissent and THE CHIEF JUSTICE correctly apply our precedents to conclude that the Individual Mandate is beyond the power granted to Congress under the Commerce Clause and the Necessary and Proper Clause. ... to say that the Individual Mandate merely imposes a tax is not to interpret the statute but to rewrite it. Judicial tax-writing is particularly troubling. Taxes have never been popular, and in part for that reason, the Constitution requires tax increases to originate in the House of Representatives. That is to say, they must originate in the legislative body most accountable to the people, where legislators must weigh the need for the tax against the terrible price they might pay at their next election, which is never more than two years off. The Federalist No. 58 'defend[ed] the decision to give the origination power to the House on the ground that the Chamber that is more accountable to the people should have the primary role in raising revenue.' We have no doubt that Congress knew precisely what it was doing when it rejected an earlier version of this legislation that imposed a tax instead of a requirement-with-penalty. Imposing a tax through judicial legislation inverts the constitutional scheme, and places the power to tax in the branch of government least accountable to the citizenry. Finally, we must observe that rewriting §5000A as a tax in order to sustain its constitutionality would force us to confront a difficult constitutional question: whether this is a direct tax that must be apportioned among the States according to their population. Art. I, §9, cl. 4. The Government's opening brief did not even address the question -- perhaps because, until today, no federal court has accepted the implausible argument that §5000A is an exercise of the tax power. And once respondents raised the issue, the Government devoted a mere 21 lines of its reply brief to the issue. At oral argument, the most prolonged statement about the issue was just over 50 words. One would expect this Court to demand more than fly-by-night briefing and argument before deciding a difficult constitutional question of first impression.